Can't import HEIC photos to my iMac. I use El Capitan and iPhone 7 running iOS 11. Photos captured on my iPhone 7 will not transfer into Photos on my iMac. While the thumbnail appears, an alert exclamation is all I get. It only started with iOS 11! HEIF, High Efficiency Image File Format, is the most efficient image format that is regarded as the successor to the JPEG format. Unfortunately, many users have stumbled upon big problems with syncing iPhone HEIC photos to Mac: exported HEIF(.heic) photos can't be viewed or open on Mac, or HEIF photos are converted into JPG format while some of you want to keep HEIF format. Follow our tutorial to transfer HEIC photos from iPhone (7/8/X) to MacBook Pro/Air/iMac without any issue of this kind. 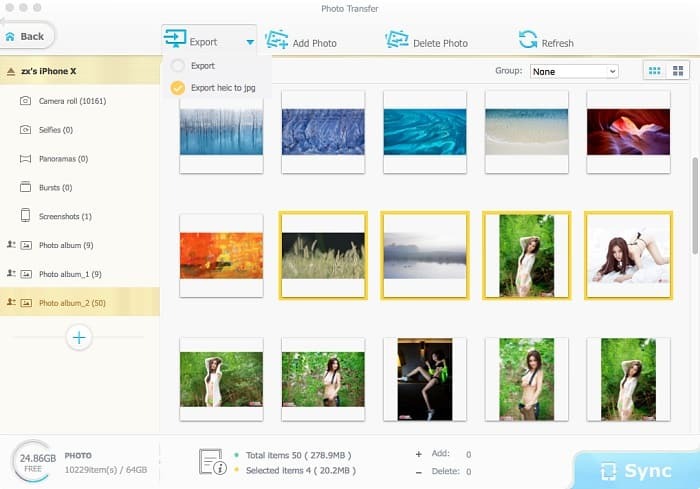 Free download the fastest HEIC photos transfer software, MacX MediaTrans to get the job done efficiently. Check out its stunning features below. Sync HEIC/JPG/PNG/BMP/TIFF photos between iPhone iPad and Mac. Download iPhone HEIC images to Mac as HEIC or JPG in batch or one by one. Access, view, delete and manage iOS 11 HEIC photos from iPhone on Mac. Also import/export music, videos, movies, books, ringtones, iTunes purchases, etc. No file size limits, support the latest iPhone 8/X, macOS High Sierra. 1. You can't open and view iOS 11 HEIC images on older Macs that cannot update to macOS High Sierra or later. 2. Photo editing tools for macOS like Photoshop, Lightroom currently doesn't support to import HEIC pictures. 3. It's likely that you run into HEIF compatibility issues when you upload or share HEIF photos on Mac. Follow steps below to download HEIC photos from iPhone (7/8 Plus/X) with iOS 11 to Mac as JPEGs with the top-rated HEIC image converter and transfer tool. Step 1: On your Mac, run the program. Connect your iPhone to your Mac with an iDevice USB cable. Click Photo Transfer button on the main interface and the Photo Transfer window will appear. The program shows all the photo albums that are on your connected iPhone on the left pane. Step 2: To move a collection of HEIC photos from iPhone with iOS 11 to Mac, click the photo album you want and select a single picture or multiple photos to export, then click the Export drop-down list icon at the top of the window, you'll see two options, "Export" and "Export heic to jpg". Step 3: Select " Export heic to jpg" if you want to export HEIC photos from iPhone to Mac and convert HEIC to JPG (JPEG) format. When you sync HEIC photos from iPhone to Mac, you can delete HEIC photos from iPhone with the software. Now, you can disconnect your iPhone from Mac. After that, you can view, open, edit, upload or share these JPG photos converted from HEIC on Mac without format compatibility issue. Bonus Tips: If you prefer JPG format that is widely accepted by other devices and photography and photo editing apps, you have the option to disable HEIC/HEIF on iPhone 7/7 Plus, iPhone 8/8 Plus, iPhone X running iOS 11 or later. To do this, go to Settings > Camera and tap Formats > Most Compatible. And your iPhone will capture pictures in JPG format instead of HEIF (.heic) format. Some iPhone users would like to export and backup iPhone HEIC/HEIF photos to Mac without changes in image format in order to save more space or for other usage. The HEIC encoder for Mac also enables you to download and transfer photos from iPhone to Mac without converting the original HEIC image format. Use steps below to do this. Step 1: Open MacX MediaTrans on your Mac, and connect your iPhone to Mac. Click Photo Transfer button, and click Export at the top, select "Export". Step 2: Choose a selection of HEIC photos on iPhone you want. To download all HEIC photos on the album, click Select All. Step 3: Click Export button at the top of the Photo Transfer screen to start to sync iPhone (7/8/X) HEIC photos to MacBook Pro/Air or iMac without changing the HEIC image format. Note: Devices that can capture photos in HEIF format include iPhone 7/7 Plus or later, and 10.5/12.9-inch iPad Pro running iOS 11 or above. In order to open and view HEIF photos exported from iPhone 7 on Mac or edit HEIF images with Photos app, make sure your Mac is running macOS High Sierra or later. If not, learn how to update to macOS High Sierra. 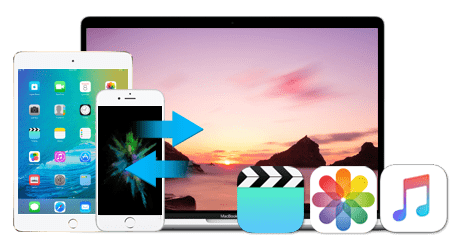 MacX MediaTrans can convert HEIF(.heic) images to JPG and export any photos in heic, jpg, bmp, tiff, etc from iPhone iPad to Mac/Windows with/without converting. Also support to delete photos, backup and transfer music, movies, videos, ringtones, books, and more.